You may have noticed that our website has received a face lift. Hopefully now it will show up properly for all of you Internet Explorer users. Stay tuned for other upgrades as we celebrate our first year on the internet! Meanwhile, Mark and I splurged and got a brand new, Energy Star freezer. We'd filled our small freezer to the gills over the last few weeks, but I didn't want to plug in the big freezer because of its leaky gasket. The new freezer has handy sliding baskets and lots of room to put away more produce, and its annual energy usage is on a par with our little fridge. 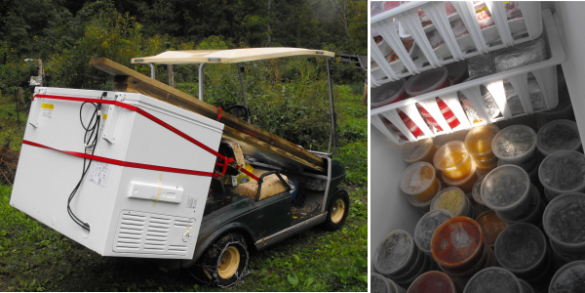 Can you believe that Mark attached it to the golf cart and hauled it back to our trailer all by himself?